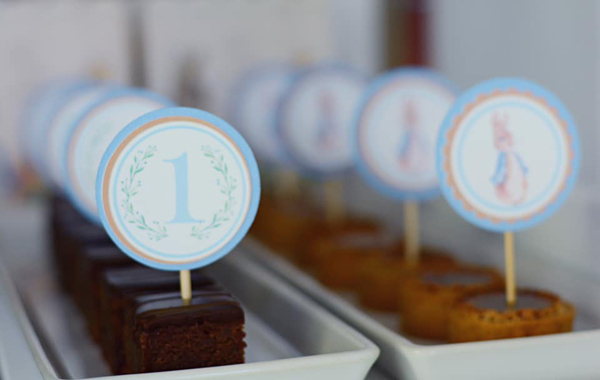 This Adorable Peter Rabbit 1st Birthday Party is absolutely everything! How sweet to celebrate such a big milestone with the best bunny in town. 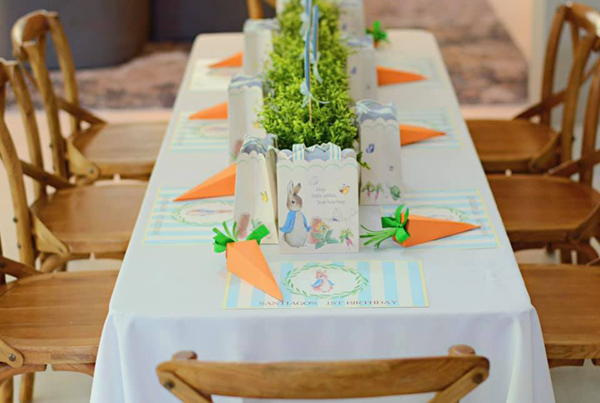 We just love this Peter Rabbit Themed Party! 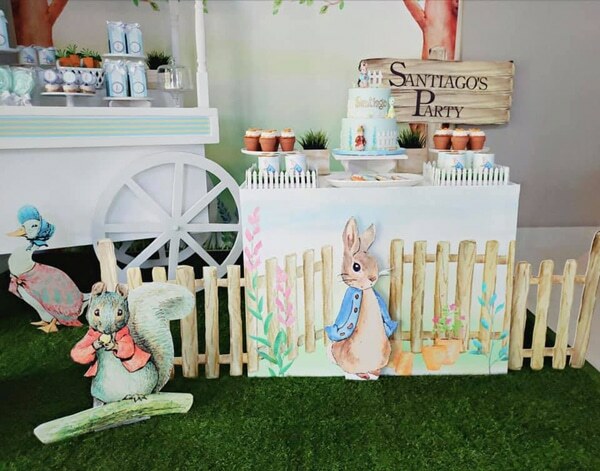 How fun to have a spring-themed adorable Peter Rabbit 1st Birthday Party from Trendy Events out of Puerto Rico. They definitely know how to throw a party! From the sweet cupcakes to the amazing dessert table and backdrop, everything about this party was pure innocence, joy and fun! 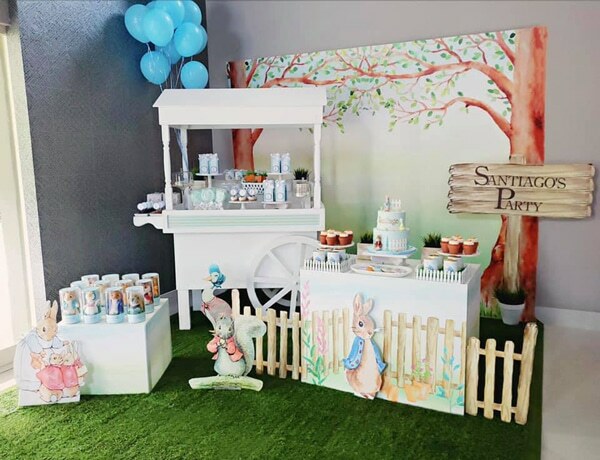 If you are looking for your own Peter Rabbit Party Ideas, this celebration will give you all of the inspiration you are looking for! What an amazing set-up to walk into when all of the guests arrived to this amazing Peter Rabbit 1st Birthday Party. All of the decorations were perfect and the icing on the cake was having the “grass” welcome everyone underneath the main dessert and drink table area. 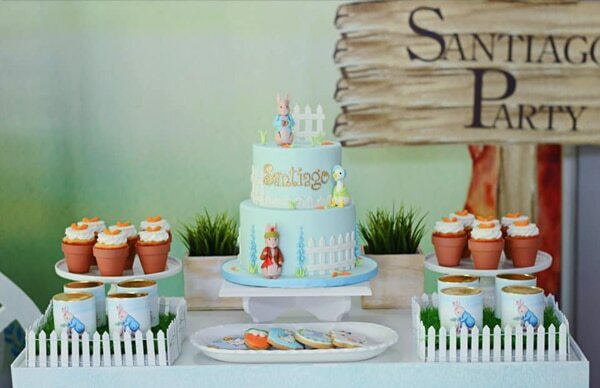 What a great idea that fit the Peter Rabbit Themed Birthday Party perfectly! It was like bringing the outside indoors for everyone to enjoy. This was one lucky little birthday boy! Of course, Peter Rabbit, himself, was front and center at the dessert table! We love that all of his little friends were there in large sized cut-outs for all of the little ones to enjoy. What an amazing Peter Rabbit Party where everything looked absolutely perfect, with a fun spring theme. The incredible Peter Rabbit Birthday Cake was created by Amazing Sugar Creations and it was, indeed, amazing! Just look at the details that were included on this birthday cake. 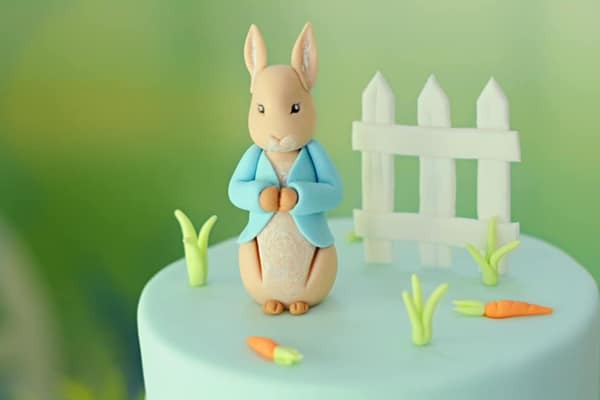 Peter Rabbit and all of his friends adorned the edges of this two-tiered cake, along with sweet carrots, a fence, and everything else that one would expect to find in the Peter Rabbit fantasy world from Beatrix Potter! Everyone was sure to be excited to dig into these Peter Rabbit Party treats! Between the amazing details on the cake, as well as the yummy-looking cookies, it was probably quite the feat to make sure everyone waited their turn to dig into the delicious cookies, cake, and other food items. 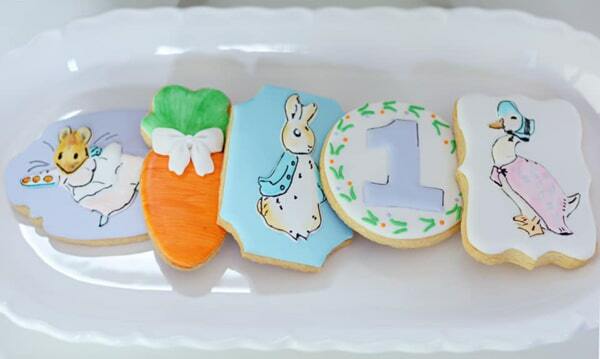 Cookies for the fun Peter Rabbit Birthday Party were made by Sugar Box PR and they couldn’t have been more spectacular! Just look at the details on them, along with the big Number 1 that was found on some cookies to celebrate this birthday boy’s big birthday! We especially love those sweet carrot cookies. 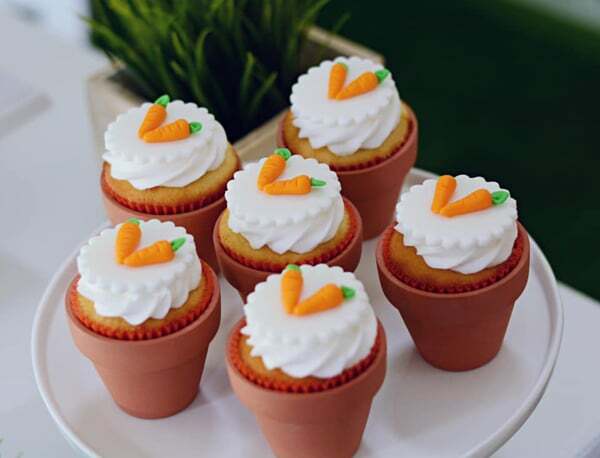 Many of the additional sweets found at the Peter Rabbit 1st Birthday Party were created by Delic Pastries, including these amazing carrot-topped cupcakes! One of our favorite things about this party is the way that these Peter Rabbit cupcakes were presented, in sweet small terra cotta pots! What a unique and adorable way to present the sweet treats at the birthday celebration. 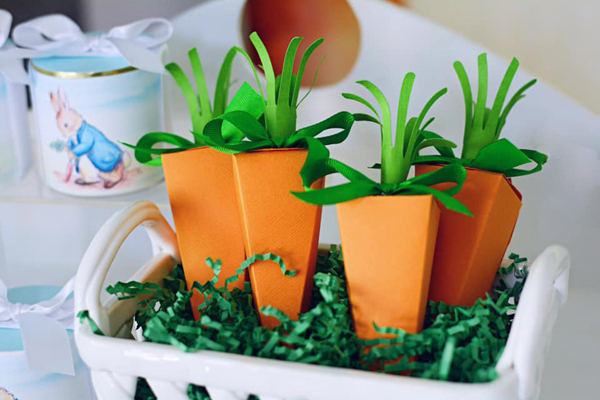 Having them included as party favors would be another great idea, along with some fun seeds to plant once the guests all got home. There are so many fun Peter Rabbit Party Ideas to take away from this event! Yum! These yogurt-topped granola treats were another big hit at the Peter Rabbit Party. What a great treat to include that is easy for the little ones to eat, as well. And with the cute Peter Rabbit “1” toppers that were added in, it made the presentation even more eye-popping! 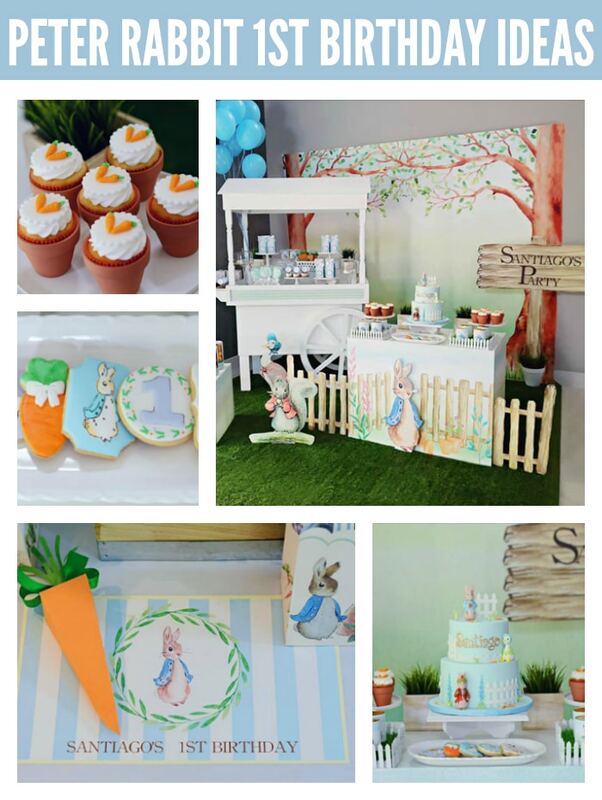 All of the personalized touches and decorations for this Peter Rabbit Themed Party were absolutely perfect! What an easy way to add in themed items to the food ideas that were presented. We love it! How about this amazing table set-up that was presented for all of the guests to sit at! Talk about an amazing display! 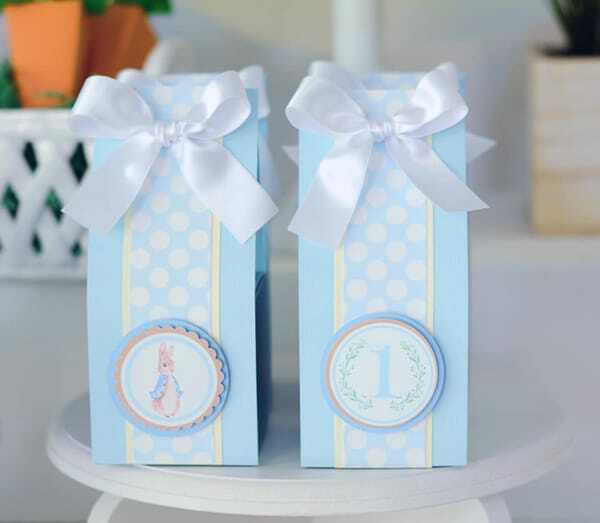 We love how everyone had personalized items at their place setting, and the fun carrot-shaped addition, along with the party favors, were a big hit with the young and old alike. We love the simple greenery that was used as a centerpiece, as well. It all looks so amazing! 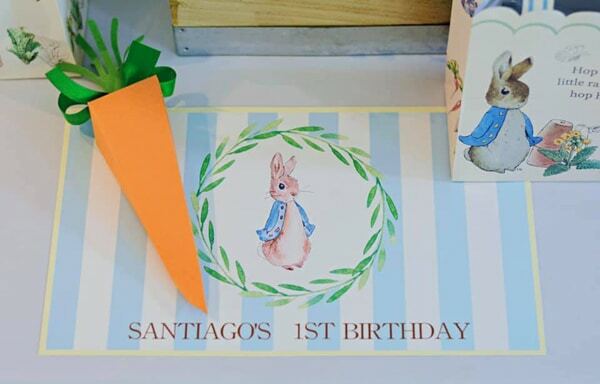 Hello Stickies handled all of the graphic design and personalized items for the Peter Rabbit 1st Birthday Party. What an incredible job with everything being absolutely perfect! Thank goodness such beautiful pictures were captured by Semprit Photography for the family to enjoy for years to come! 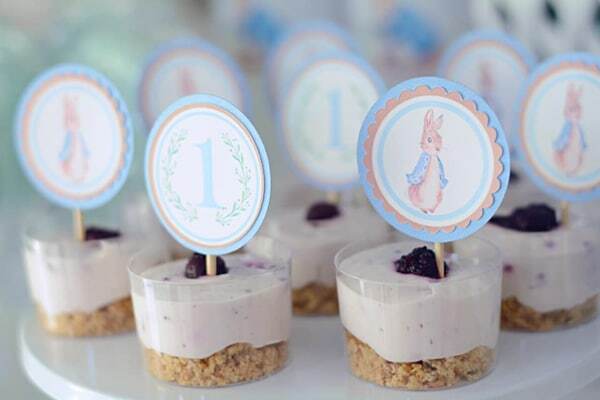 While their little one may not be as appreciative for this incredible Peter Rabbit First Birthday Theme party now, they sure will down the road when they see these amazing pictures and details that were created for their big day! Everywhere you turn, cute decorations were found around the Peter Rabbit Birthday Party. Of course, this bunny wants to make sure there are lots of carrots around for his lunch, so it is a good thing that Trendy Events complied with carrot decor around the birthday celebration! 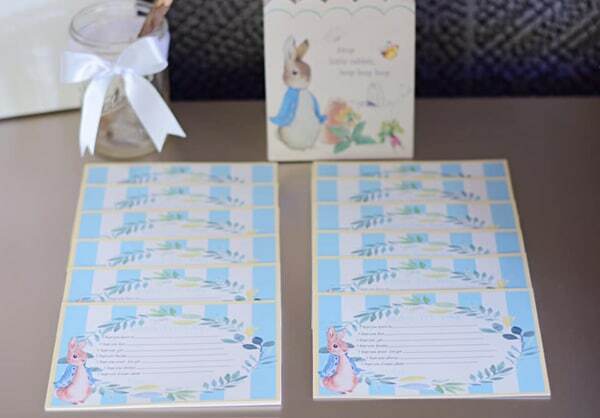 Sweet little notes for everyone to fill out for the birthday boy were found at the Peter Rabbit Birthday Party. What a great thing to add into a scrapbook that can be enjoyed for years to come. We love this idea! 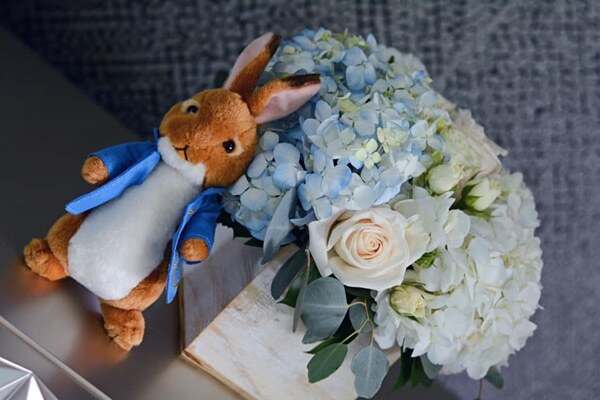 And of course, the most perfect Peter Rabbit Party Favors were created for all of the guests to take home. What a lucky little guy that got the most perfect first birthday celebration ever! We love everything about this party and the adorable additions found from one side of the event to the other. 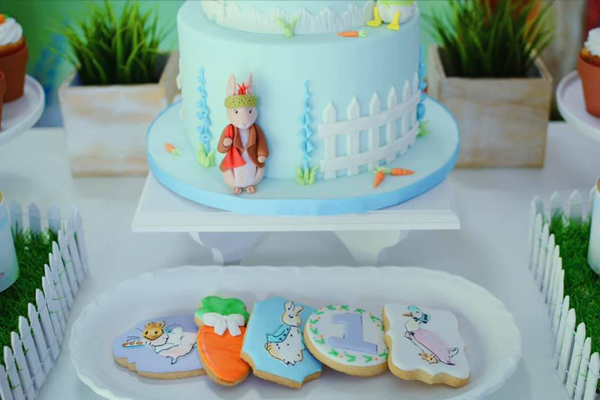 What’s your favorite details in this Peter Rabbit 1st Birthday Party? Let us know in the comments below.